Mary Ward is a powerful image of an independant, free thinking, spiritual woman. Marryatville. 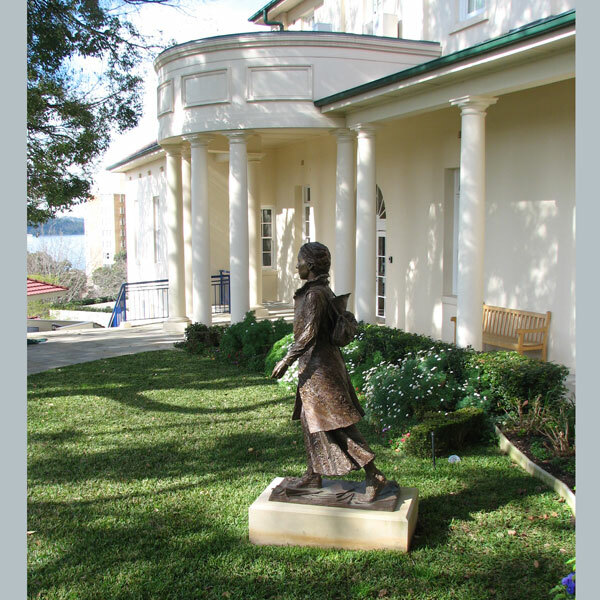 In the heart of the school, where the girls gather for their breaks, Mary has become a familiar and personal image. Ballarat. Gracing the sweeping carriageway leading to the Old School building, Mary greets all guests as they arrive. Nedlands, WA. A small primary school, they raised the funds for the sculpture by selling bricks with the donors names, paving around the work. John xxiii, WA. 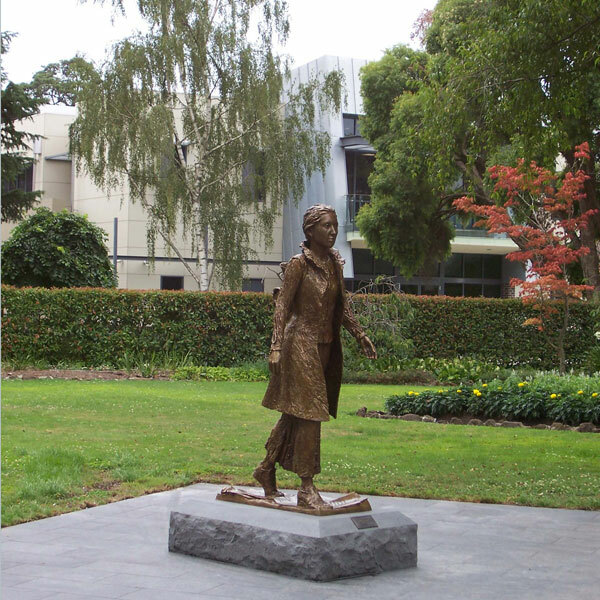 Placed beside the Mary Ward centre for special needs students, Mary becomes a symbol of compassionate care. 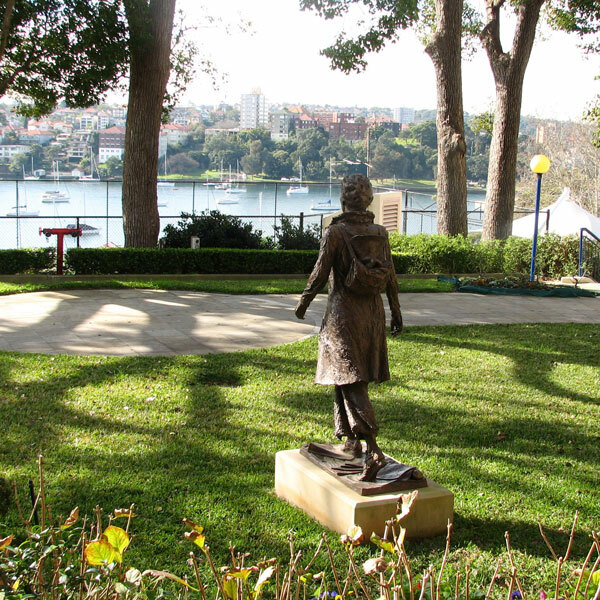 Kirribilli, N.S.W. Mary enjoys the beutiful views of Sydney Harbour. The sculpture was made as an unclad clay first, so as to retain the dynamic movement in the piece. The life model, Georgia, with her body double. 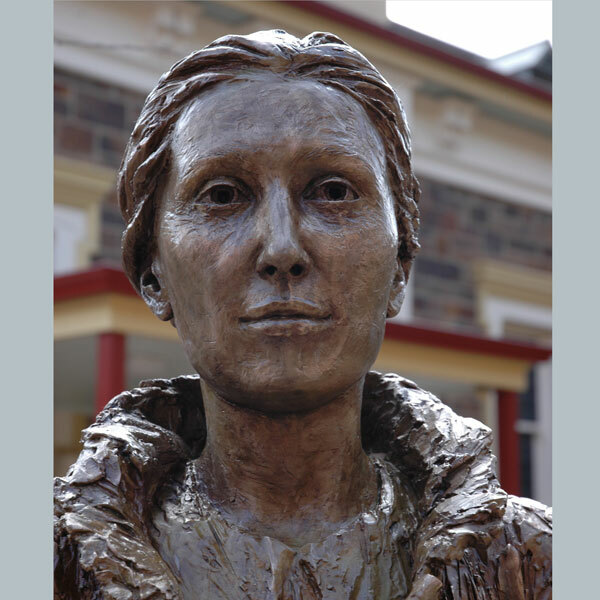 The life model bears a strong resemblance to Mary Ward, the same strong jaw, aquiline nose and deep set eyes. The base is covered with quotes from Mary Ward's letters, and with other clues to her story like the pawprints of a dog. A map shows the Institutes that Mary Ward established in her lifetime. A lemon gives refeence to the lemon joice letters she wrote from prison. A woman's faith held close. Mary's small Rosary that she carried with her becoems the walking meditation. 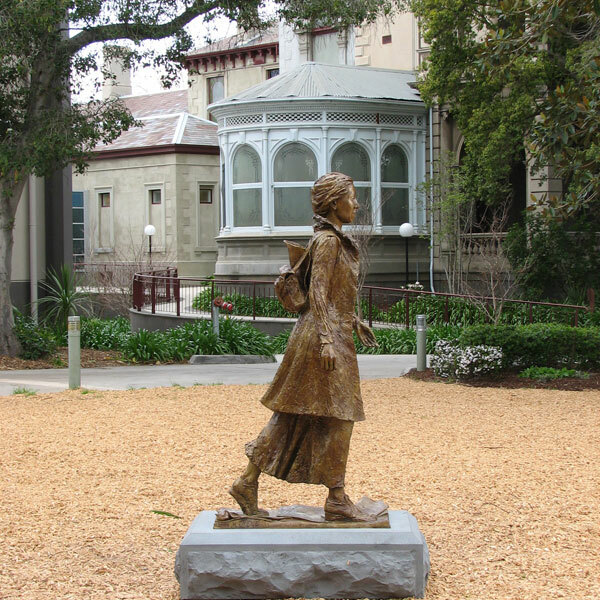 The Institutes that Mary opened during her lifetime are marked on a map on the base of the statue. 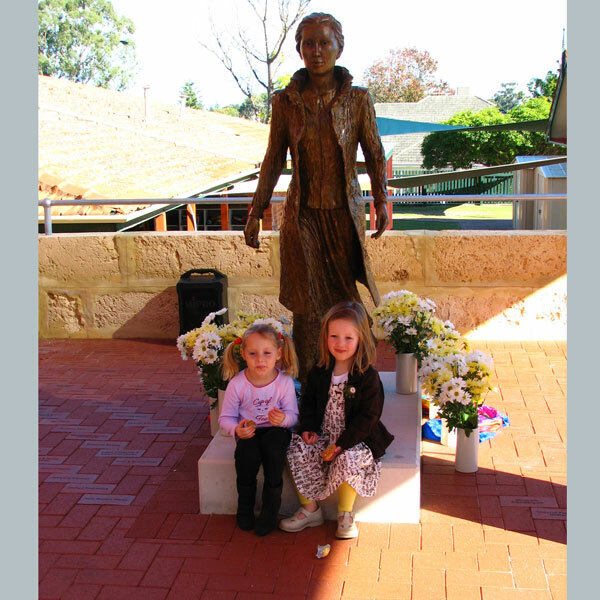 The Normanhurst girls cluster around Mary the day of the unveiling. In 2001 the Loreto Schools Advisory Committee (LSAC) decided that “an enduring image” of Mary Ward should be commissioned for the schools. 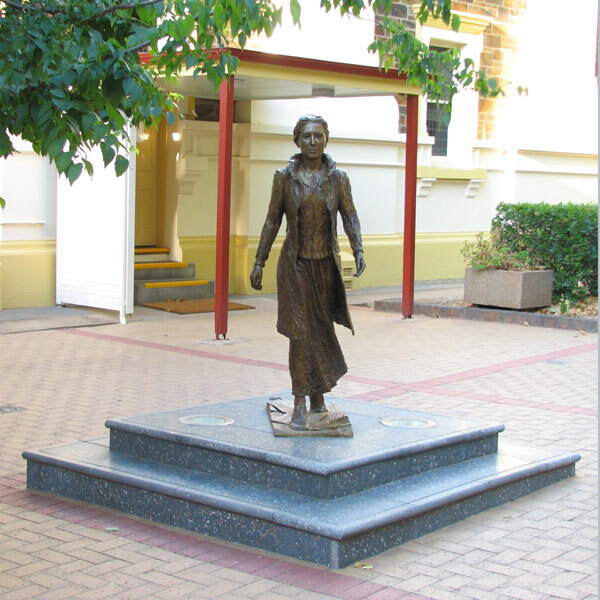 The sculpture was to be cast in bronze as an edition of eight, one for each of the Loreto schools in Australia. The idea was to produce an interpretive sculpture, exploring the history and charism of Mary Ward. The intention was to bring her story to life for a new generation of young people in the schools. 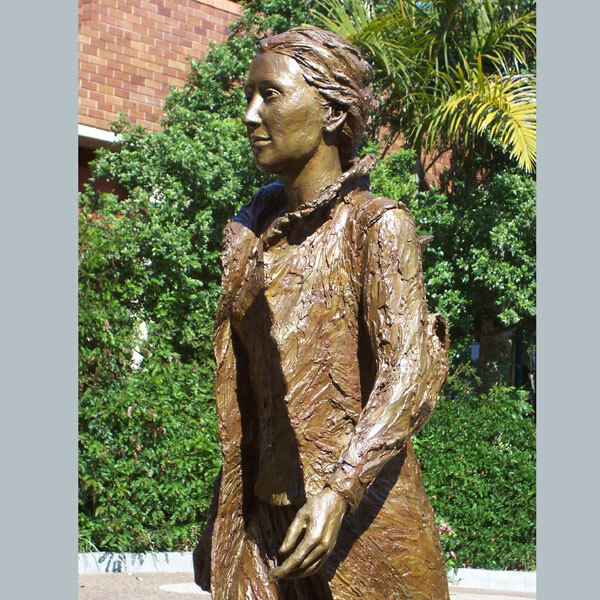 The sculpture exists to unify the Loreto community across generations and across the nation. It must have must have grace, strength, longevity and sincere emotion. It must relate the story, communicate directly with the viewer, and bear repetition over the years. It must evoke the spirit, the message and meaning of Mary Ward’s life and work. A woman's faith held close is the primary metaphore of the work. A single decade of the Rosary with a small cross, is in her hand. As she wolks this becomes the walking meditation, a private an personal relationship with he God. Mary is depicted as walking forward strongly, carrying her worldy goods on her back as she crosses Europe time and again in the work of the Institute. The sculptue is rich with symbols of Mary's life and faith. The base has scribed quotes from her letters, a map showing the Institutes she established in her lifetime. The little children are fascinated by the pawprints of a dog on the base, as well as a lemon, each in reference to a story from her life. 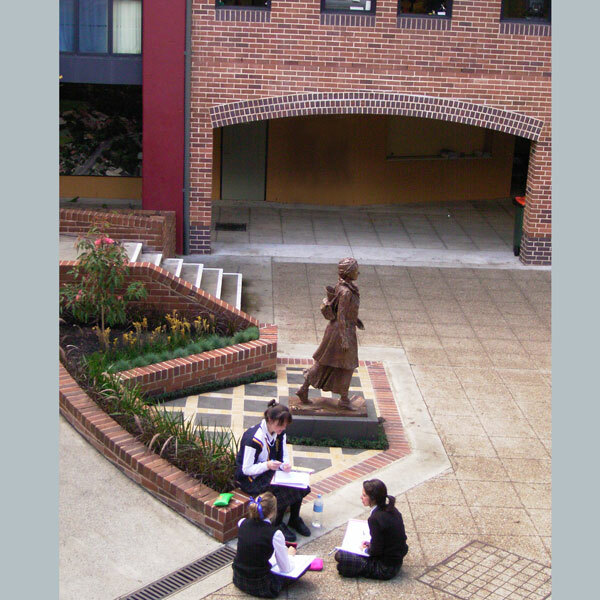 Over time Mary Ward has become an identifying symbol, a familiar face in every Loreto School. The students are photographed with her on their graduation, and discuss her life in their reflections and liturgy. Availabilty: The sculpture was commissioned as an edition of eight, now completed. The commissioners have approved the casting of a second edition should there be the demand from the worldwide Loreto communites. There are two maquette sizes also available to order as an artist's edition.